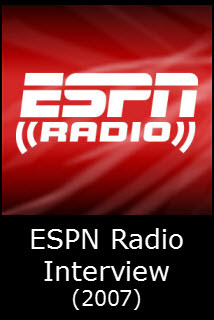 Originally aired on July 27, 2007 @ ESPN Radio. Listen to Mack talk sports and movies with Colin Cowherd (WMA format, approximately 45 minutes) to benefit The Caring Place whose mission is to "... support, educate and empower individuals, children and families on their journey with cancer, in order to enhance their quality of life. The Caring Place provides FREE programs and services designed to complement conventional cancer treatments."